Home // Blog // SPIRITS – BP and Attributes Booster on Gears! SPIRITS – BP and Attributes Booster on Gears! 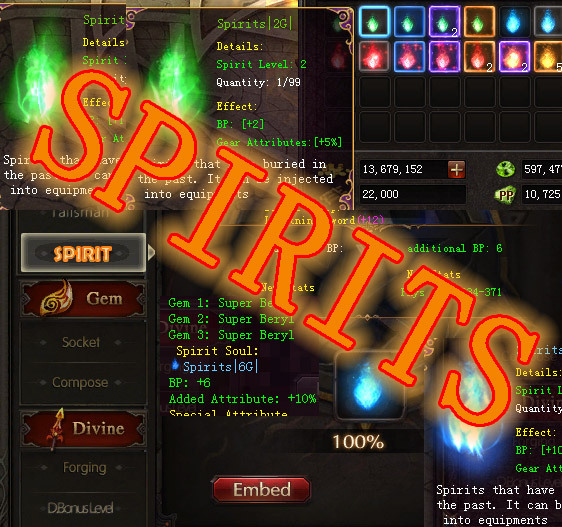 There are 18 levels of Spirits existing on server. They usage is to attach 1 Spirit to 1 Gear part and providing this way additional Battle Power to character (wearing the gear part) along with % attribute bonus to gear part to which is embeded! Spirits are available from lvl 1 to lvl 18. LVL 18 provides +60 BP and 45% attribute bonus at most! Going this way – player can attach Spirits into 6 gear parts making 6x Spirits into usage – max BP from spirits to obtain = 360 ever! Rest is just a boost of attributes (to be clear this affects the DIVINE BONUS ATTRIBUTES!). There are 3 Functional Panels under SPIRIT section at FORGING section! Example: If you lucky and get lvl 9 Spirit from 2xlvl1 – You can dismantle this in order to get 256 x lvl 1 Spirits. Use this info properly! Rates changed only once at the begining – for lvl 18 Only (before obtained yet). Rates are easy/hard – but doable basing on players effects. So dont overdoo with clicking to not get bored and tire to much – do it little by little 😉 Just know that its possible to get lvl 18 just by having few lvl 1 = all is about luck (once you lose, other time you win). 0 Comments ON " SPIRITS – BP and Attributes Booster on Gears... "